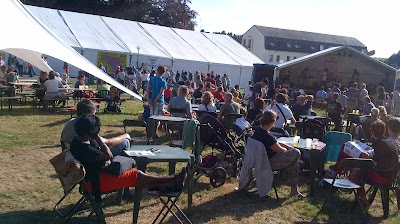 Imagine starting your own jazz festival in the countryside. Imagine that festival keeps on growing, and here it is in its 29th year, in the South Belgian (Wallonian) region of Gaume. It's put together by a close-knit group of friends. Jean-Pierre Bissot (photo above)started it all way back, and still chooses most of the bands- he's an inspiring figurehead, running everything from his picturesque office in the tiny village of Rossignol-Tintigny. Its Cultural Centre is the hub: tents and teepees are set out in its sheltered grounds where you can buy everything from chips to gourmet potatoes. 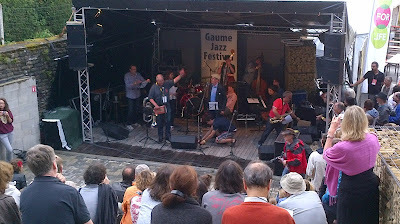 His organisation is 'Jeunesses Musicales', getting young people involved in jam sessions and workshops as well as the main gigs. It's a family affair: tiny children cycle round the coloured tents of those camping under the lush trees, while older people drink excellent Belgian beer under canopies. The first night started just like a UK festival, with simultaneous sun and rain- no-one seemed to mind; the skies cleared and there was a real buzz of expectation. One of the festival's aims is to have a wide variety of music, and there's certainly that. From Belgium was honey-voiced local singer Géraldine Cozier and lyrical pianist Georges Hermans. Flamboyant and fun, Belgian Nu-Orleans quartet Big Noise put the anarchy back into the old music, with Dr. John-style piano from Johan Dupont and Raphael D'Agostino's acrobatic trumpet. One of this year's Festival themes is Women in Jazz, and in the huge main tent, international quartet .Zip featured French drummer extraordinaire Anne Paceo (influences range from Afrobeat to Brian Blade, she told me). Fronted by excellent sax-player Maxime Bender (from Luxembourg ), their original music ranges from moody atmospheric modal grooves to something akin to Tony Williams' Lifetime, with Frisell-like guitar from French guitarist Oliver Lutz. In the day's final gig, South African singer Tutu Puoane sang a beautiful Miriam Makeba 'click' song before the 17-piece Brussels Jazz Orchestra joined her, unusually using two recorders in the mix for a soft folky sound. The programme was a tribute to South African vocalist and anti-apartheid activist Makeba; her songs were brilliantly arranged by band members. Puoane sounds very like a young Dianne Reeves, from gentle laments, to African improvising to full-strength belt and scatting with the sax soli. 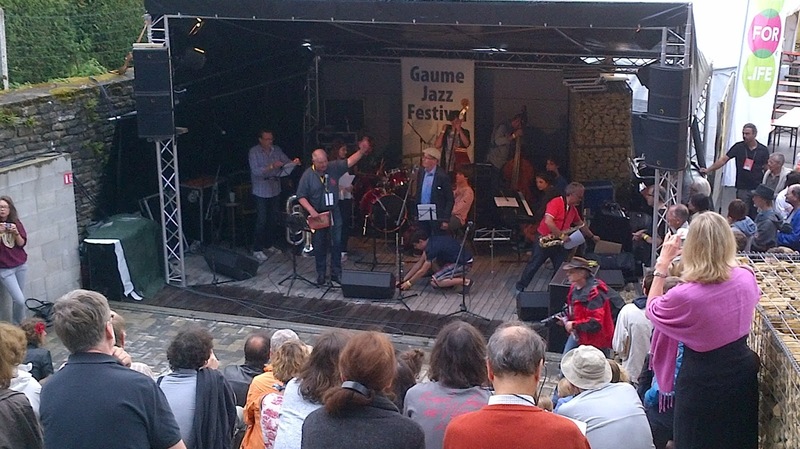 The biggest applause of the gig was for bandleader Frank Vaganée's impassioned Cannonball Adderley-esque alto solo. Very affecting was When I've Passed On, (Makeba fought cancer 'with the help of this song '). Long vocal lines blended exquisitely with four-part trombone harmonies. The programme won a 2011 South African Music Award, and should be heard all over the world.